How do I queue several jobs to run consecutively using Discribe? > Knowledge base> Article: How do I queue several jobs to run consecutively using Discribe? 2. Select the appropriate job type and create your job according to the instructions for that job type. 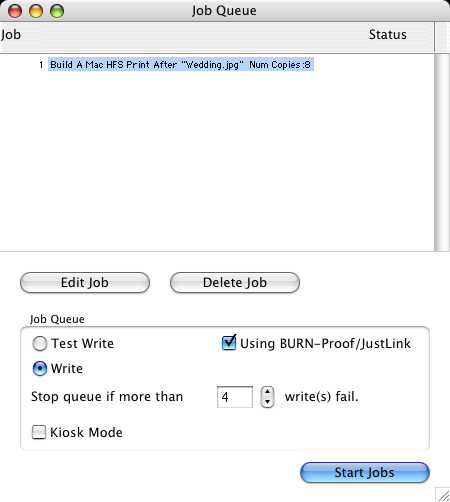 Click the Queue Job button instead of Robot Write when the job is ready for submission. 3. You will be prompted to save the job. Click Save. 4. Name your job. Click Save. 5. Once you have saved your job, you will see a Job Details Pane. 6. 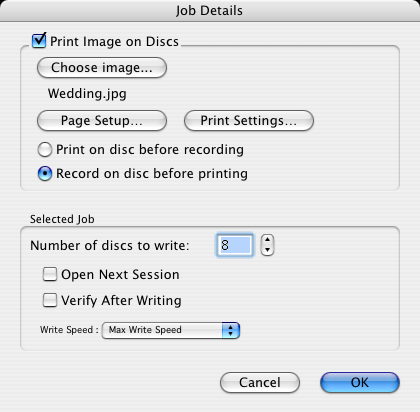 If you would like to print an image on the disc, check the Print Image on Discs box to enable printing. This will enable other buttons in this pane. • Press the Choose Image button to select an image to print. • Click the Page Setup button and set Format For to Disc Publisher. Set paper size to CD/DVD. • Print Settings will launch the Printer Driver settings when clicked. • Set the number of discs you would like to copy. 7. Once you have selected your image and chosen your preferred settings in the Job Details Pane, click OK and your job will be submitted into the Job Queue. 8. Return to Discribe's main menu by clicking on the Discribe pane, bringing it to the foreground. Repeat the steps above for each individual job to be queued. 9. Once all the jobs have been queued, review the job queue settings window before starting the jobs. The job name, print file and number of copies are displayed. 10. Click edit to edit the number of copies or print file associated with any job. You may also set all jobs to Kiosk Mode on this screen. Stop Job after Number of Writes Fail allows you to decide how many consecutive failures the Bravo will accept prior to canceling a job. Click Start Jobs to start all jobs. Note: Discribe cannot queue disc to disc or stream jobs.